Silly Sally - who has no plan, and at about 4pm every day starts to wonder what's for dinner, struggle to figure it out, and either dashes to the supermarket for some ingredients and is inevitably late getting dinner out, no to mention frazzled and worn out, or decides it's all too hard and ends up buying takeaways. Again. Sally always spends too much as a result of her haphazard lack of organisation. And she never feels peacefully in control of this important area. Or Wise Wanda - who planned her menus before she went shopping, bought exactly what she needed, has everything on hand, knows what is for dinner, and quite possibly got everything prepared or started early in the day so that later when she's caught up with other things, it takes but a few moment to turn things on or finish up dinner prep. She feels good - she has kept within the family budget, and meals are on time, nutritious, and she is relaxed enough to enjoy this important time with her family, gathered around the meal table. Menu planning isn't hard, but it IS important! Deciding ahead of time what meals you will prepare allows you to properly plan your grocery shopping, control your budget, keep your family happy, organise your time, use what is in season, and ultimately to plan your garden too. Even if you are the only person in your household, having planned meals will be beneficial - freeing time, money, and ensuring you eat a range of nutritious food. You can plan all meals and snacks, or just plan the main meals for each day, and then also purchase the basic fixings for breakfast and lunch to have on hand. In this article, we're going to focus on planning the main meal, but you can repeat or expand the process to cover the other meals too if you like. If you at least have dinner planned, life will be so much easier! Begin meal planning by coming up with a list of things you already know how to cook, and that your family likes. Brainstorm on paper, listing every meal you can think of that you often prepare, either currently or in the past. A quick glance through your most used recipe book might refresh your memory, but don’t go hunting for recipes - start with what you know. Get your family in on the act - have a brainstorming session together, and if you like, make it extra fun by “rewarding” all ideas. For example, buy a large block of chocolate, break it into squares, and “pay” for each meal suggestion with a square of chocolate. You can do the same with M&M’s, or your family’s favourite healthy treat, such as nuts or dried fruit. The next step is to go back through your list of meals, and divide it into groups of 7 days. Two such groups will make a menu for two weeks; four for a month. It’s fine to allow a blank day here and there for leftovers and impromptu simple meals, or eating out etc. Generally though, I plan for 7 meals for 7 days, and if we don’t use one of them, I simply won’t need to buy the ingredients for that next time, as they are already on hand. When putting together a list for a week or two weeks, think about spacing out like foods - for example you might not want to eat red meat three nights in a row - I’d be more inclined to alternate with fish, vegetarian or chicken based meals. Think too, about whether any particular nights you need to eat early or later, or have more simple meals due to other commitments in the family. Plan easy or crockpot meals for your busiest days. It is useful to have your menus written out on a chart - that way you can see at a glance what is planned for when. I recommend posting your chart on the front of the fridge - that way everyone else can see too, and it avoids the endless questions of "what's for dinner?" Also, if you have older children or adults in the house, if you are busy they can see what is for dinner, know all the ingredients are on hand, and get it started for you. 2) A daily dinner box, with space to put options for other meals more generically. I also have a "Remember" box - this is to write any main events of the day which will affect meal times/planning. For example, my daughter does an ambulance shift on Tuesday nights, and I need to remember to have dinner ready early on Tuesdays so she can eat before she goes. 3) A chart that focuses on planning the main meal and side dishes, with some space at the bottom to write options for other meals. Again, this has the "Remember Today" section. In our house, I plan and prepare the main meal, but everyone helps themselves for breakfast and lunch - my job is just to make sure there are plenty of suitable foods/options on hand. This works for us well now that the kids are all old enough to fend for themselves; with them all coming and going I would be hard pressed to know how many to make food for on any given day at lunchtime anyway. When they were all small, I used to prepare all the meals each day. If you can, plan up to four weeks of menus. But don’t worry if you haven’t enough ideas!! Work with what you know! Two complete charts will mean two weeks of meals, and you can easily just keep rotating these two menu plans indefinitely, until you have fresh ideas later on. Only eating the same thing once every two weeks will be just fine for ensuring variety and balance in your meals, and is a good place to start. Just one more quick idea - if you still can’t think of any meals, use these charts and write down what you DO eat for a week or two, then use that info to plan. So, take it one step at a time - I know you can do it!! This is going to make your life so much easier!! Go for it! With a theme for each night, all you then have to do is pick suitable meals to match. To come up with a month's worth of meals, you'd need 4 mince based meals, 4 soups, 4 chicken dishes, 4 lamb or beef dishes, and so on. Make sense? Having this concept in mind can save you spending lots of time looking for too many meal ideas - you know you just need to select a certain number of each type. Once you have some weekly menus planned, you are going to want to create a grocery list to match each menu, so you'll know just what to shop for. Collect together or write out the recipes for each item on your menu, and then go through them and write a list of ALL the needed ingredients. HERE is a chart you can use to do this, divided by item types to make shopping easier. I like to keep a copy of each menu and it's grocery list together in sheet protectors in a binder, or in a clearfile folder. In fact, taking this one step further, why not have each menu AND a copy of all of its recipes together in your clearfile? I do this and it makes it so easy to prepare dinner - the recipes are to hand, the ingredients are in the cupboard, and I or any of my family can access them all. Using sheet protectors or a clearfile also means they can be used in the kitchen, and any splatters wiped clean. If you are using a Master Grocery list (highly recommended), then you might want to create a modified version of it to go with each menu, so you won't forget anything when you shop. Otherwise, just update the individual ingredients on it each time you use it to prepare for shopping. Imagine having a folder full of menu plans. Each menu plan is for one month of main menus, and it is seasonal, based around what is in season in the garden at that time of year. So there is a Spring menu plan, a Summer menu plan, an Autumn menu plan and a Winter menu plan. Each menu plan is used three times - so in the course of three months you eat each meal three times. And then the season changes, and so does the menu. You'd be eating a good variety, seasonally. Imagine having your garden planned so that everything you are able to grow that is needed for the menus will be ready in your garden at the right time. No more wondering what to plant, when, or wondering what to do with it. You'd be saving even more money because you'd be using lots of food you grow yourself. Those things you needed to buy would be in season, and so at their lowest prices. Imagine having every recipe necessary all together in one place, in a binder. No more hunting for recipe books. This IS possible! Of course, you'd want to do something different every now and then - no problem; you'd just switch out a planned meal here and there. But, basically, you'd know just what to plant, what to cook, what to purchase. You'd become such an expert on what your family needs and uses that you'd easily spot a good bargain and be able to stock up on the right things at the right price at the right time. Good menu planning takes some time to start with, but in the long run it will pay dividends in time and money saved. The effort will pay off - and you will have more time to relax. Good advice. After all, if you shop when hungry, the chances that unauthorized chocolate bars and nuts and oh, definitely items from the fragrant bakery department, will somehow dive into your grocery cart when you're not looking are very high, not to mention just buying more of things because you're hungry! And if you don't have a list, you will no doubt forget important things, and buy things you don't really need. However, most people who DO use a list aren't very systematic. The list is probably more like a partial list, scribbled hastily on the back of a handy envelope. This is definitely better than no list at all, but usually still results in the shopper relying on spotting other things they need as they go around the store, and usually means spending more than intended, and/or buying unnecessary extras. Let me introduce you to a better way....... the master grocery list! 1) The very first step in creating your own master grocery list is to take an inventory of your pantry, fridge, freezers, bathroom & laundry cupboards and so on. I include food, cleaning supplies, animal food, toiletries and everything else I normally buy when grocery shopping. This list doesn't have to be fancy - just get everything written down in a readable format. 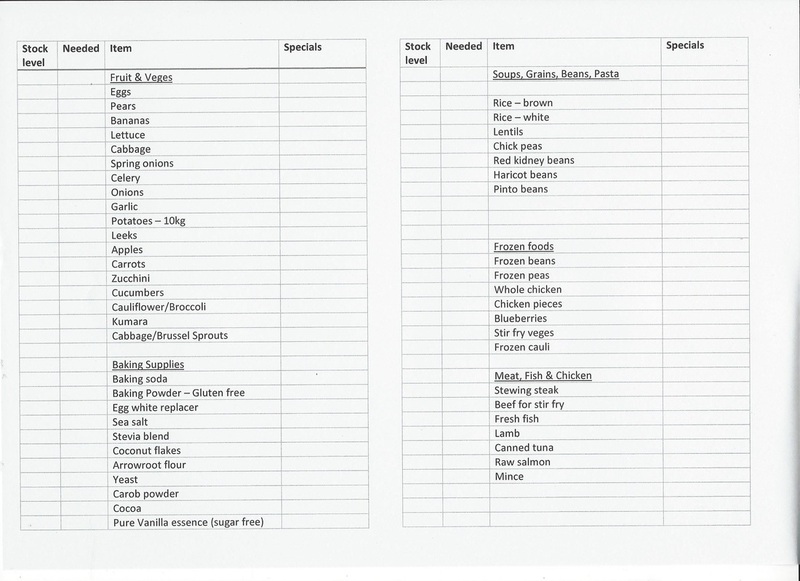 My master grocery list has 5 pages like this, with sections for fruit & veges, baking supplies, soups/grains/beans/pasta, frozen food, meat/fish/chicken, bathroom & laundry, pet supplies, first aid & cleaning supplies, dairy, bread/spreads & other, nuts/seeds & health foods, herbs & spices. In fact, since it could save you a lot of time, I'm going to share with you my master grocery list in Word HERE - you can download it, modify it, and use it as your own if you like. 3) The third step is actually using your master grocery list. You can either print a copy each time you're due to go shopping, and write on it, or keep a copy in sheet protectors and mark it up with a whiteboard pen. I go through all my supplies with list in hand, and cross out everything we already have plenty of, then mark next to those things we need the number or weight of items needed. Next, I go back to the computer, save a copy of the master grocery list under a separate file name (I call it "Groceries this week" and save over the top of that one each time), so that the master list remains intact, and then modify this newly saved file so that ONLY the items I need to purchase remain on it, with quantities added. Then I print this shorter list, cut and staple it, and I'm good to go. The Stock level column is one I used to have permanently filled out with the total number/weight of the item I liked to have on hand. So, for example, if I liked to make sure when I finished shopping there were 6 cans of tuna in the cupboard, 6 would be in the stock column next to canned tuna. When I look in the cupboard and find only 3 cans remaining, I would write 3 in the Needed column, as this is the number that would bring me back to my stock level. I use the stock level column more when I am working off set menus, as the number would be based on what needs to be on hand for those menus etc. This has another advantage - if I'm busy/sick/away, any member of the family can use the master grocery list, check off what is in the cupboards, and know how many more of a given item to buy - that way they won't miss anything important when they do the shopping for me, or if they're just helping me prepare the list, they can do that part on their own easily. I'm not using the stock level column much myself right now, as our diet changed so much recently I need to rethink things, but it really is very handy! First I stop by the farm store to buy bulk animals feeds. These are fine sitting in the van while I get everything else. Then I go to specialty stores for non-perishable items I know I will find cheapest there - eg Asian market, Gilmours, bulk store etc. Next, I go to Pack 'n Save, the supermarket which I generally find cheapest overall, for the rest of the groceries. However, as I go through each of these places, I check my list. If I get to Pack 'n Save and see their butter is $3.50 each, and I have NW $2.99 written down in the specials column, I know not to buy it at Pack 'n Save, but to make a stop at Countdown on the way home for butter and any other items that are at better prices there. If it turns out there is only a tiny savings to be made overall by a stop at Countdown, I might choose to go ahead and buy at Pack 'n Save and skip the extra stop. But if there are enough items/savings to make it worthwhile, or if I need to go there anyway for some things I can't get at Pack 'n Save, then I do so. Make sense? Finally on my way home I stop into the other supermarkets if there are savings to be made there, and lastly stop, if needed, at places like the vege market or butchers on the way home. I don't visit all of these places every time, usually, but according to our needs and best thrifty shopping at the time. There is one more way that the master grocery list can make my life way easier and help me stick within budget - if money is really tight, and I know I absolutely must NOT go over budget with the shopping, after making my specific list, I will go through it and write next to each item it's approximate price. The prices are drawn from specials flyers, past experience, my Price Book (which I'll write another post about), or looking them up online. I can then total it all up and know with a reasonable degree of accuracy what the shopping will cost. If it's too much, I can choose now, at home, what to cross off the list. I leave the items crossed off visible, but with a line through. That way when I actually shop, if I beat the prices I listed and have some extra dollars left over, then I might choose which crossed off items are highest priority and be able to get some of them after all. This also motivates me to even more diligently look for the best priced items and brands in the store, so as to free up those few extra dollars. When money is tight, it is much more comfortable and less stressful to go shopping, list in hand, and KNOW you will be able to afford the chosen items, and possibly even "win" by being able to get a few more, rather than going HOPING you can afford everything, and then being stressed about having to put things back when it's too much. That's how a thrifty kiwi rolls! Another way to use the master grocery list - pin a copy up inside the pantry door. When anyone notices something has run out or is running low, they can circle that item on the list. If you are running to the store in between main shopping days for a few perishables, you can tell at a glance if there is anything else that might be urgent enough to pick up at the same time, if it can't wait until the next shopping day. And just a couple more tips: In the past when I've had kids helping me shop, sometimes I have spilt the list up, giving some of the kids a page or section each, and their own trolley or basket, to run off and get those items and bring them back to me. Also, on my original master grocery list I was very specific about preferred brands, item size etc, so if someone else shopped for me, they knew EXACTLY what to get. And thirdly, when you have helpers, a set of walkie-talkies is fabulous - I could direct a given child to go to an aisle and get a couple of items. When they got there and compared prices, they could use the walkies to check in with me which brand I would prefer, given the prices, and then bring me back the right one. This saves time in not having to change things, and makes it fun for the kids too. With a couple of walkies and three kids helping, I could do shopping that would normally take me an hour alone in 15 mins flat! When kids bring things back to me, I would check them off my own shopping list as we transferred them to my trolley, so I would know everything was covered. Note: when you first use a master grocery list, it might feel like it takes you a little longer. But stick with it. I find after a while of doing this, the list and what I need this week are so familiar, that by the time I've taken inventory and made my list, my brain knows exactly what is on it, and I can cruise through the supermarket very fast (skipping unnecessary aisles and not needing long to make decisions), and then just pull my list out near the end, check everything off, and maybe cruise back down an aisle on the way to the checkout for the one item I missed. A little preparation saves time! To gain the maximum savings of time and money, use a Master Grocery List in conjunction with Menu Planning and a Price Book - each of which I will post about soon. To sum up, using a master grocery list will make planning your shopping easier, save you money and time, and help you remember everything you need. It can take the stress out of sticking to a budget, and rescue you when you need other family members to help with inventory or shopping. I wouldn't do it any other way! Are you ready to start using your own Master Grocery List, and shop like a master?